Reading is such a huge part of our days, and I wouldn't have it any other way. I read* 7+ books to the little ones every day. One mention of "book" and 2-3 of them are clambering for my lap or a spot right next to me on the couch. And then they'll take turns bringing me book after book after book. They do have short attention spans and tend to wander off after the second story, but return a little later for another round. One of the best things we can do for little prereaders/early readers is read aloud to them (and talk with them ... if nothing else, talk with them). So we read. My older kids are big readers, for the most part. 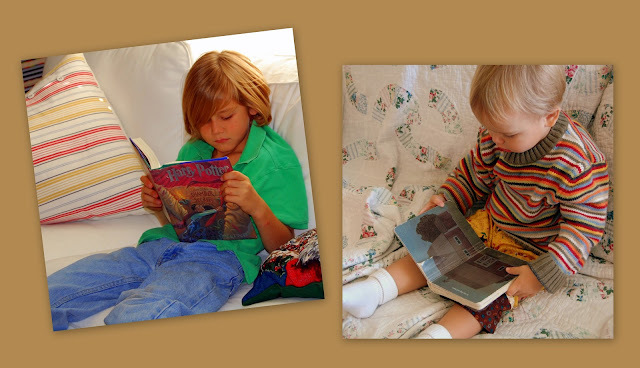 The oldest three have had their noses in books since they first learned to sound out words. Adam will read, but it's not his favorite thing and Kaden has just begun really discovering books (beginning with Harry Potter). One of the most exciting things to watch is a child discovering the world in books, finally opening the door to the wonderful adventures, explorations, and fantasy books provide. It's as if their neighborhood has grown ... no longer are they confined by the walls they live in or the geographical restrictions placed on them by their parent(s), suddenly they can travel to Oz, or the prairie, or Hogwart's, and then join Nancy Drew on excursions of mystery and adventure. It brings me such joy to see my kids begin those travels. *My older kids also read to the little ones. It's good for their confidence, diction, pronunciation skills, and gets that reading in when one doesn't like to read (kind of like sneaking veggies in in spaghetti sauce).